There is a Factory creative industries networking event at the Burslem School of Art, Stoke-on-Trent, on Thursday 8th May 2014 (6.30pm to 8.30pm). There will be a talk from Helen Palmer, Director of Palmer Squared of Stockport. Helen is also the Joint Head of Marketing & Development for the British Ceramics Biennial in Stoke-on-Trent, and she will be talking about… “what branding really means, why it’s important and how branding can make a real difference to your business”. Scott Grindey, from Stoke-on-Trent City Council’s Competitive Intelligence Team, will also be explaining the full range of market research and other free business research services available to all local businesses. If you would like to attend this free event then please email factory@stoke.gov.uk to book your place. Interest-free business loans are now available from Creative England… “for small to medium-sized companies outside of London looking to develop new products”. Keele University’s SPEED Plus business startup programme is now open for applications. SPEED Plus is for those with a untested business idea or “a hobby that could turn into a business”, but who need help and support to get it going. The training takes the form of a six month, part-time business startup project, which is only open to university graduates in the West Midlands region. The deadline date for applications is 2nd June 2014. Successful applicants will start with a short induction in mid June 2014, for a start on 8th October 2014 and completion on 31st March 2015. See the website for full details. Small £300 grants are available for local projects intended to help the over-50s in Stoke-on-Trent. Craft Courses UK is currently listing a variety of short professional pottery courses in Staffordshire for 2014. These include: Basic Throwing with Duncan Hooson; Electric Kilns, Operation, Control and Maintenance; Glaze Application with Kevin Millward; Mouldmaking and Slipcasting; Glazing and Firing; Tile Making with Richard Miller of Froyle Tiles; Tiled Murals with Penny Hampson; and Plaster Model and Mouldmaking for Slip Cast Ceramics, among others. Stoke-on-Trent’s Appetite is now taking bookings for two workshops in June for visual artists and curators, both at the AirSpace gallery in Stoke-on-Trent. Cost is £10 per person. Work: Stoke-on-Trent City Council invites tenders from design agencies for a new graphic design framework. The Council plans to… “appoint up to five consultancies to a four-year graphic design framework worth around £200,000”. Application deadline: 7th May 2014. Stoke-on-Trent’s Appetite is seeking volunteers to support their community arts programme in the city during 2014. There will be induction days on 14th and 17th of May in Newcastle-under-Lyme, aimed at giving applicants a better idea of the various roles available. Interested? See this Web page for full details and an application form. The North West Women’s Enterprise Day 2014 is to be held in nearby Crewe on 21st November 2014. The event is booking now, with only 250 tickets available. 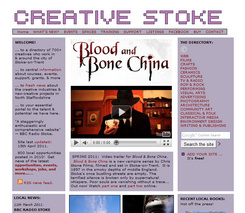 The website for the first Stoke-on-Trent Literary Festival, ‘Hot Air’, is now live with a full programme and taking bookings for June 2014. Expressions of interest are invited from writers, performers and directors interested in collaborating on a new fringe theatre / storytelling project, “Stories from Pub Corners”. This is destined for a tour of Stoke-on-Trent pubs during Summer 2014. Application details (PDF). The short film Seclusion, made in Newcastle-under-Lyme, has reportedly been selected for the Cannes Film Festival. There’s now a crowdfunding campaign to raise money to send the film-maker to Cannes along with his film. There’s a new crowdfunding campaign for the Bang arts exhibition at the Spode factory in Stoke town. Gallery 116’s Summer Open photography competition and exhibition is now open for entries. AirSpace Gallery in Stoke-on-Trent has an open curatorial opportunity. Project fee: £3,000, inclusive. Deadline: 6th July 2014. There is also a graduate residency for students graduating from B.A. and M.A. Fine Art courses, for which the deadline is 13th June 2014. See their website for full details. Hidden Earth 2014 is the UK’s national caving conference, to be held in Leek in September 2014. For their art and film shows they are inviting submissions of cave related creative work in photography, video, art, and cartooning. See the website for full details. Staffordshire County Council’s Community Arts Development Programme is inviting applications up to £2,500 for project grants… “which encourage long-term arts engagement and which support community cohesion and development”. Application deadline: 30th April 2014. “explore ideas of collaboration, partnership working and the possibilities for the cultural regeneration of [the wasteland between AirSpace and the nearby Tesco]”. The fee is £500. Application deadline: 8th June 2014. Job: UCB in Stoke-on-Trent require a Head of Digital and Broadcast Fundraising. Deadline: 28th April 2014. The UK government’s Department for Business, Innovation and Skills has announced a new £500,000 Science and Society Community Challenge Grant Scheme to support to create and run pilot projects that… “take science to diverse audiences”. There are three levels of project funding: up to £10,000, up to £20,000 and up to £40,000, depending on the size and difficulty of the project. There would appear to be an obvious role here for sci-art crossovers in engaging communities with scientific ideas and methods, and North Staffordshire has major science expertise in the likes of Keele University / the new Science Centre at Staffordshire University / and in major private industry R&D centres such as Lucideon (formerly Ceram). See the website for full details of the new grants. The Decorative Arts Society (DAS) has established a small Collections Access Grant which aims to support curators in extending access to, and knowledge of, the decorative arts in their collections. For the first year of grant-giving, the DAS has earmarked the sum of £2,000 for the grant. Application deadline: 30th September 2014. See the Web page for full details. Job: A rare funded/paid PhD opportunity at Manchester School of Art, in partnership with Stoke-on-Trent’s British Ceramics Biennial: “At the Edge: the designer-maker and industrial innovation“. Deadline: 30th April 2014. Jobs: A number of Lecturer jobs are currently available at Chester University, in Drama and Theatre Studies, Popular Music, and Photography. Job: Stoke-on-Trent’s Appetite requires an Ambassador Coordinator to manage Audience Development to encourage more people to experience the arts in Stoke-on-Trent. Application deadline: 21st May 2014. See the Web page for full details. The main downstairs gallery at The Light House, Wolverhampton, is now available for hire for wall-mounted artworks or photography. £500 for two weeks, inclusive of installing and removal. “Longer periods may be negotiated”. The Marburae Gallery, in nearby Macclesfield, is inviting submissions from photographers for a photography exhibition in February & March 2015. Deadline: 14th May 2014. “There will be no submission or hanging fees, and only a commission of 25% on all works sold.” Interested? Send 10 images of your work to marburaegallery@gmail.com along with the title, dimensions, and price inclusive of 25% commission. Submissions are now being accepted for the 2014 Shropshire Open to be held in Shrewsbury from 13th October to 17th November 2014. This exhibition is “open to all artists” and it appears you don’t have to live in Shropshire to enter. An entry fee applies. Deadline: Friday 19th September 2014. Details and entry form. Interested in sound design? There’s a Staffordshire University showcase day in Stafford on 6th May 2014, demonstrating the work of the second and third-year Sound Design undergraduates. Little Miss Creative is a new network… “uniting and empowering young creative women in West Midlands”. Bookings are now open for the Buxton Festival and Fringe. Various traditional well-dressing festivals are going on at the same time in nearby villages. Job: the Buxton Opera House needs a new CEO. Added to the Directory: stokegigs.co.uk offers a comprehensive local gig listings service. Added to the Directory: Colourwalls is a new wall mural painting service. Added to the Directory: a new website from Stoke-on-Trent artist Marcus Wemyss.